Work Surface: 18" x 40"
Desk top and treadmill deck have an attractive mahogany laminate. Treadmill folds up vertically to save space. Desk must be swiveled to the side to fold up treadmill. Desk has too low height adjustability to be used comfortably as a sit/walk desk. Small desk top can’t support monitor arms or keyboard trays, making for poor ergonomics. The NordicTrack Desk Treadmill does an excellent job of showing you what NOT to get when choosing a treadmill desk. Its size and incline function make for a decent running treadmill, but don't result in a productive workplace tool. Its meager desk surface lacks the adjustability and ergonomic customization that are integral to a good treadmill desk. Despite its bells and whistles, and its high price tag, the NordicTrack barely counts as a treadmill desk. Over a year after our initial review, NordicTrack has slashed the price on this device and is now advertising at half the MSRP. With zero user reviews on Amazon, it's clearly not a hot seller. We predict they will drop it from their product line after the initial production run sells out. If it ever sells out. Like the ProForm Desk Treadmill, the NordicTrack unit isn’t a treadmill desk so much as it is a running treadmill with an ergonomically insufferable desk surface bolted onto it. Not conducive to proper office work, it really belongs in a gym. Treadmill desks are not intended to be cardio exercise machines, don’t need to go above 2.5 mph tops, and definitely don’t need incline mechanisms to boost your heart rate into the sweat zone. They are intended to allow you to have some healthy movement while getting your work done. In our opinion, having reviewed every other treadmill desk out there on the market down to controller boards, actuators, and laminated surfaces, the NordicTrack doesn’t even minimally meet the criteria for a productive walking workstation. And with a top speed of 6 mph there is no way that any corporate legal department would ever allow such a unit to be used on company premises. True walking treadmill bases used for bona fide treadmill desk applications usually have a top speed of 2.0 to 2.5 mph, and no incline function. The goal is to raise your BMR (Basal Metabolic Rate) higher than when you’re just sitting or standing, to have your calf muscles pumping more blood back up to your heart, and to keep your joints loose, well-lubricated, oxygenated, etc. - but never to get anywhere near a cardio exercise heart rate. The moment you start sweating the productivity benefits begin to disappear, cognitive skills decline and oh, yeah, you start sweating all over your desk – and, if you work in an office - into your business attire as well. While this incline function could be useful in a gym treadmill meant for running, it runs antithetical to what you're trying to accomplish with a treadmill desk. At the same time, this gym treadmill is paired with an ergonomically hideous so-called "desk", all but guaranteed to put undue strain on your wrists, arms, and neck, and increase the risk of carpal tunnel syndrome and other repetitive strain injuries. As such, the new NordicTrack treadmill desk gets our lowest editors’ rating. Priced identically to the ProForm Desk Treadmill at $1600, you’ll find the same basic features. While the ProForm has a flip-down console where you can plant a laptop on when you’re walking, the NordicTrack has a desktop that swings in and out of the way, articulating off a single corner post. The desk platform is electrically height-adjustable – a feature only found on ProForm’s Pro model (for an extra $400) – although nowhere on the manufacturer’s website are there any specs such as the height adjustment range. From one YouTube video we found it appears that the desk platform may not be adjustable down to a conventional 29" - 30" desk height, but rather a few inches too high for practical use for any extended period of time. At the same time, the desk surface appears to be much too short to use while on a treadmill. This limited height adjustment range makes gives the desk the worst of both worlds. If all you want to do on your treadmill desk is watch videos on Netflix this may be alright (though you’d be craning your neck down, as there’s no way to mount a monitor arm to this contraption), but if you expect to be able to actually type for any reasonable period of time you can practically forget about it. Oh, and there’s no way to mount an ergonomic keyboard tray, either. Footprint and weight – Most people who want one unfortunately do not have the space for a treadmill desk in their office, so every inch of footprint is at a premium. 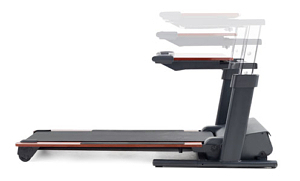 The NordicTrack appears to be at least 13" longer than a bona fide office treadmill like the iMovR ThermoTread GT. The good news is the NordicTrak can fold up to a vertical stowage position when you’re not using it.The bad news is this is a multi-step operation involving unhitching the desktop on one side, swinging it out of the way, folding up the treadmill desk, and swinging the desk back, then hitching to the pedestal for nominal stability. Doing this a few times a day will quickly become arduous, particularly if any of the devices you use have cables attached to them. We couldn’t find equipment weight specs published anywhere, but this unit looks as if it would weigh much more than other office treadmill bases. It does - according to the few specs they do list - sport a "commercial motor," which implies it may be too noisy for a work environment as well (The Lifespan TR5000's AC motor features a loud fan that proves distracting over time). All this points to its proper environment being a gym, not an office. The low height of this desk is just one of the ways the NordicTrack is ergonomically deficient. 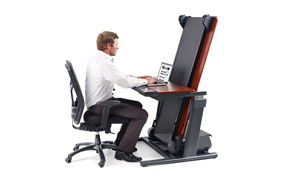 Ergonomics – Working at a treadmill desk introduces even more ergonomics issues than working at a sitting desk. With the belt pulling you backwards and your body constantly swaying, there is a strong tendency to press down very hard on your palms in order to maintain hand position over the keycaps. The faster you walk the harder it becomes to type, and the more time you spend correcting errors. That is why keyboard trays with steep inclines, and in particular desks with integrated SteadyType keyboard trays, are so essential to a good ergonomic setup. The NordicTrack treadmill desk offers neither a way to install a keyboard tray nor do they offer an integrated one. This is a setup for carpal tunnel and all sorts of other repetitive-strain injuries (RSIs) after prolonged periods of use. When it comes to typing comfort and productivity, the NordicTrack appears to have joined Steelcase and LifeSpan in having spent zero effort addressing treadmill-desk keyboard ergonomics. Besides lacking a way to mount a monitor arm or keyboard tray, the desk design also requires you to reach across the treadmill controls and and LCD screen to use your keyboard, causing you to hunch way over the front edge of the desk to type. If your posture is so good that you’ve never been susceptible to the injurious pains of "computer hunch," using this desk will surely afflict you with it. If you’re already a computer hunch sufferer, we’re not kidding when we say that typing extensively while at this desk could make you a daily visitor to a physical therapy clinic. Reliability – Because NordicTrack hasn’t yet submitted their product to our testing labs and doesn’t publish transparent specifications, we have not yet been able to verify the type of motor that is used in the product. Like many treadmill manufacturers, they obfuscate the specs that an engineer would want to know and disclose only the deceptive and relatively meaningless horsepower rating. The NordicTrack treadmill desk uses a 3 HP "Durx Commercial Motor," but we don’t know anything else about its torque rating, RPMs, power consumption, noise signature, or even whether it is an AC or DC motor. What we do know is that a DC motor has linear properties such that if the top speed of the treadmill is 10 mph, at 1 mph it would only produce 1/10th of the horsepower, and would be at high risk of burnout if used at very low speeds for long periods of time. And if it’s an AC motor it’ll consume a lot more electricity, and mostly likely have a very noisy continuous fan on to keep the AC inverter cool.The good news – sort of – is that like the NordicTrack desk treadmill, the ProForm, comes with a lifetime frame and motor warranty, so if the motor burns out you’ll get an unlimited number of free ones. That said, the parts and labor warranty is only one year long, so if the motor controller blows (a very common problem with running treadmills that are pushed beyond their capacity pulling dead-weight walkers across the deck), prepare to potentially spend almost as much on the diagnostic and follow-up repair service calls as the entire treadmill desk cost you. Vibration – Again, we haven’t seen this unit in action yet other than observing people on YouTube walking on it but not actually typing on it. A principle of proper treadmill-desk design is that the adjustable-height desk and the treadmill are never physically bolted together. That’s not the case with the NordicTrack, so we suspect that every footstep will send oscillations up to the desk surface, no matter how heavy the steel frame is. These vibrations can affect your productivity, especially your typing accuracy. Key-cap travel distance on modern keyboards is so minute that any vibration in a treadmill desk set-up is invariably going to result in frustrating typos. In blending both a running treadmill and walking workstation into a single unit, NordicTrack has attempted to design an SUV of sorts (i.e. a car/truck hybrid). While it may be a very good running treadmill it fails to meet even the minimum criteria for a healthy, productive treadmill desk. Our 1-star rating reflects only its appropriateness as a treadmill desk, as we don’t hold ourselves out as experts on running treadmills. Since this unit is not being sold on Amazon, it’s hard to find any verified-buyer user testimonials online, only exercise-treadmill dealers proclaiming it "probably the best treadmill desk out there." Since these folks obviously aren’t office-fitness experts, we’ll forgive them their misplaced enthusiasm and remind you that the actual "best treadmill desk" will have paid a lot more attention to ergonomics and office esthetics. Our conclusion is that you could spend less money to get a running treadmill that is just as good. But if what you’re really looking for is a real treadmill desk to work at, our advice is to keep looking. See the numerous options available in our treadmill desk comparison guide. As soon as NordicTrack ships us a test unit we’ll update this review, of course. Subscribe to our free newsletter to make sure you stay abreast of all the latest office fitness product developments. I purchased this unit and it was broken from the start, so I never got to test the features. After many calls to NordicTrack and ICON, I got the swap out arranged. They brought another unit, which was also not operational. I would not recommend this product and after my experience with NordicTrack, I would prefer to find an entirely new vendor. Surely you can understand why this concept might be VERY appealing to people who work from home and don’t have a lot of space or budget for two separate treadmills…one for walking / desking, and one for running or at least jogging. It’s at least SUPPOSED TO BE the “best of both worlds,” as you alluded to in the review. Obviously the design needs to be tweaked or even possibly DIY hacked. So I have some questions. 1) You say it can’t accommodate monitor arms. Why not? Is it because when you turn the desk to the side, the back of the monitor arm clamp gets in the way of folding up the treadmill deck? I know it doesn’t have grommets, but many monitor arms don’t rely on grommets. 2) Why can’t it accommodate a keyboard tray with a little drilling? No, it’s not built for that, but could it be hacked for that relatively easily? Or would that also get in the way of adjusting the desk up and down or folding up the treadmill? I would see those as inherent design flaws. 3) Did you ever figure out the actual maximum desk height for this? 4) Are you concerned about the motor failing with long bouts of walking? If not, buying this product plus that monitor arm / keyboard combo would still be way cheaper than buying one treadmill for me to walk / work on and a second treadmill for my wife to jog on. My job as a travel planner requires that i sit for hours and hours leaving me sore by the end of the day. So far im LOVING being able to move a bit. I wish it had a pause function. 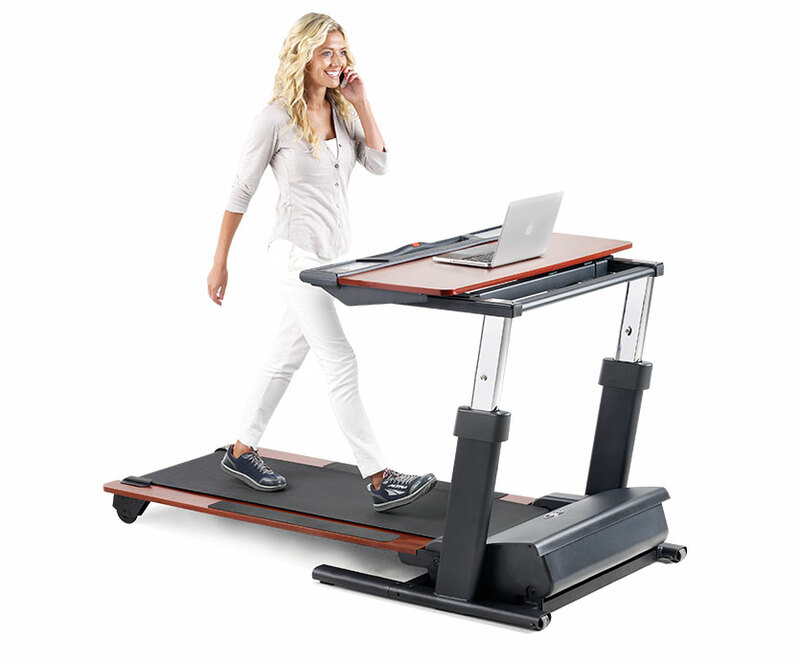 As for the product itself, it is NOT useable as a treadmill desk or as a fitness treadmill. I am now convinced that a fitness treadmill and treadmill desk are two completely different products. Yes, they both share a treadmill but that is where the comparisons end. Let me explain. 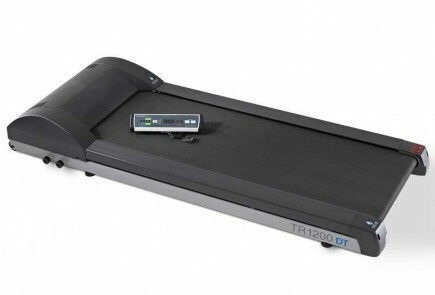 Motor- The NordicTrack uses the same 3 HP motor that is used in their $750 home fitness treadmills. This is NOT a good thing. The motor has low torque at slow speeds and high torque at fast speeds. What does his mean? If you attempt to walk on it 4-8 hours per day (like most treadmill desk users do) it will prematurely burn out the motor and electronics. The unit has a lifetime motor guarantee but that does not cover the electronics or labor (you have a 1 year warranty here.) So each time you burn the motor out, it will easily cost you $400-$500 to replace the damaged components. Ergonomics- In order to use a treadmill desk the right way (and the comfortable way) it is required that the desk rest at a 90 degree angle from your elbow. At full height, the desk on the NordicTrack is thigh high. Don’t believe me? Look at every picture on their website. I am 5’10 and I had to lean forward to type. It was impossible to type while walking plus I had to crane my neck forward in order to look at my laptop screen. This is the opposite of ergonomic. My wife (5’4) tried to walk and type and it was way too low for her as well. I guess it would work well for children. Safety- Even if I wanted to use this as fitness treadmill it is not safe to use. The treadmill reaches speeds of 10 mph and inclines 15%. Try running at a high speed or walking at a steep incline without those handrails that you find on gym treadmills. If you lose your balance for even a second you are going to fall and seriously injure yourself. That handle on the desk (that supposedly replaces the handrails) does absolutely nothing to address this concern. It is too far out of the way to reach. The treadmill also lacks those side rails that you can stand on when you need to step off the belt. The NordicTrack treadmill desk is a good looking product but it lacks all of the basic functionality of either a treadmill or treadmill desk. I am also convinced that everyone promoting the Nordictrack version is getting financial compensation from the company. Do yourself a favor and research before buying. It is expensive and highly inconvenient to return a treadmill desk.